Traditional Mexican music encompasses influences of both the indigenous Mexican people and those of the European colonists and settlers who have passed through the country over the years. Though traditional Mexican music has waned in popularity versus contemporary musical genres over the years, its influence can be heard in the music of modern Mexican musicians. How Do People Celebrate Mexican Independence Day? Mariachi bands are perhaps the best known traditional ensemble. They are the international face of traditional Mexican music. Mariachi bands originated in the Mexican region of Jalisco in the mid-1800s and were originally, in essence, wedding bands. The popularity of Mariachi ensembles spread quickly throughout Mexico. In 1907, Mariachis began earning an international reputation when the Mexican government chose a Mariachi band to perform for the visiting US Secretary of State. 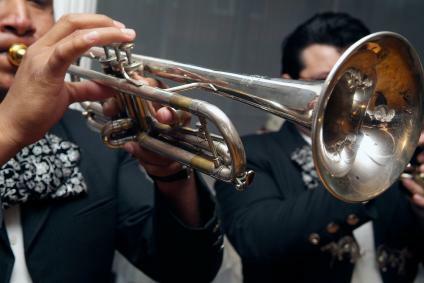 The golden age of Mariachi music was the 1950s, when the bands were featured in a number of movies. Though Mariachi has never again met those heights, the bands remain internationally popular. Mariachis typically play a number of different traditional genres, including ranchera, polka and corrido. Banda can refer to a type of ensemble and a genre of music. Bandas are brass band collectives featuring brass, percussion and woodwind instruments. Banda ensembles were once a regional phenomenon. They appeared in Sinaloa in the 1880s and were extremely popular with the influx of Germans who moved into the region during that time. In the early 1900s, however, Bandas' influence spread all over Mexico as well over the border into Texas. These large ensembles - most Bandas have 10 members or more - play polka, rancheras, boleros and cumbias. Folk music is an extremely important part of Mexican music history, especially among the indigenous community. Lyrically, Mexican folk music describes events in Mexican history, traditions and traditional Mexican folk stories. Musically, there are several different sub-genres of folk music played by different ensembles. The most popular of these ensembles are conjunto norteno, conjunto huasteco and conjunto jarcho. The differences between the ensembles boil down primarily to the instruments featured, through regional musical influences also figure prominently. Cumbia originates in Colombia, but immigrants brought the music to Mexico, where musicians adopted it as their own. Mexican cumbia differs from Colombian cumbia in a number of ways, including instrumentation. There are also many regional takes on cumbia. Though a traditional music form, cumbia experienced its greatest popularity in the 20th century, particularly in the 1970s. After Mariachi ensembles, cumbia is Mexico's biggest music export and it remains one of the most contemporarily popular forms of traditional music. Mexico often doesn't get credit for its classical music roots, but in fact, classical music is one of Mexico's oldest music genres. Classical musicians in Mexico sprang up starting in the 16th century, thanks in part to Spanish colonists, who introduced the genre to the indigenous Mexicans. Mexican classical music was originally referred to as the "music of New Spain." Originally, Mexican classical music was only popular in Mexico, but by the 18th century, Mexican composers began influencing European classical music. Many online Mexican music stations focus on contemporary pop music, but you can find some traditional sounds on the net. Visit Mexicana Radio and Radio Quelight to get a taste of old Mexico.